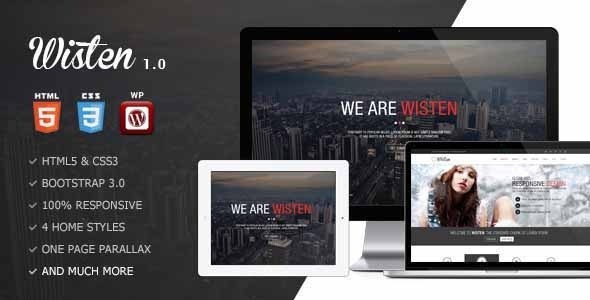 Wisten 1.0 newest version : Released on May 22nd, 2014. 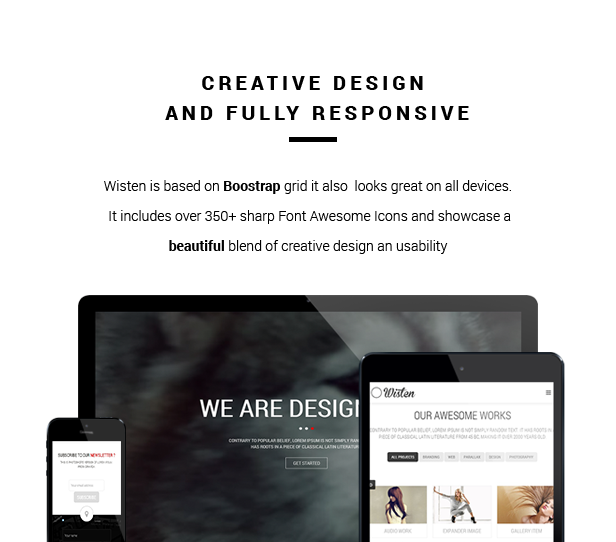 Design and Flexibility – Wisten is a blend of stunning design and great flexibilty, is built using easy manageable shortcodes and clever sections layout management. Clever Section Management – Choose section position, section icon and section type directly from WordPress Menu management. Portfolio Items – 4 Types of Portfolio Item (video, image, gallery, sound-cloud) – with 2 possible layouts and built-in sharing icons. Portfolio Item Showcase – 3 ways to display Portfolio Item : lightbox, expander, project page. – adjustable per item. Drag and Drop Re-order – Built in portfolio item management, re-order portfolio item order by drag and drop. Custom Google Maps – Customize your map directly from Theme Options modify colors for most Google Map Element.. Multiple Location – You can use up to 3 independent markers for Google Map. Mail Chimp – Stylized Mail Chimp Subscription form (via Mail Chimp plugin) . Contact Form 7 -Stylized Contact Form 7 – You can easily modify the fields and add you own elements using this free plugin. ColourFul – Unlimited Secondary Color – choose wisely . 300 Icons and counting – Font Awesome Integration . 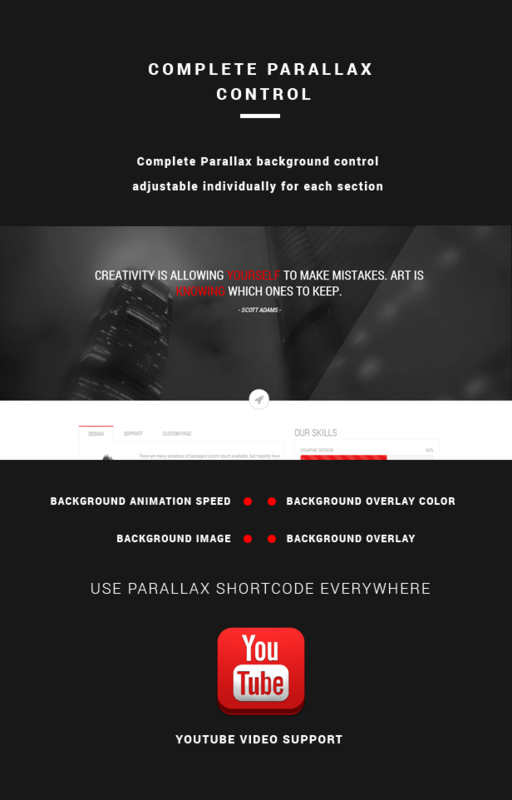 Live in motion – Youtube Video Background support for sections/separators . Menu Position Alternative – Easy change the menu position (before / after home section / adjust slogan slider etc). 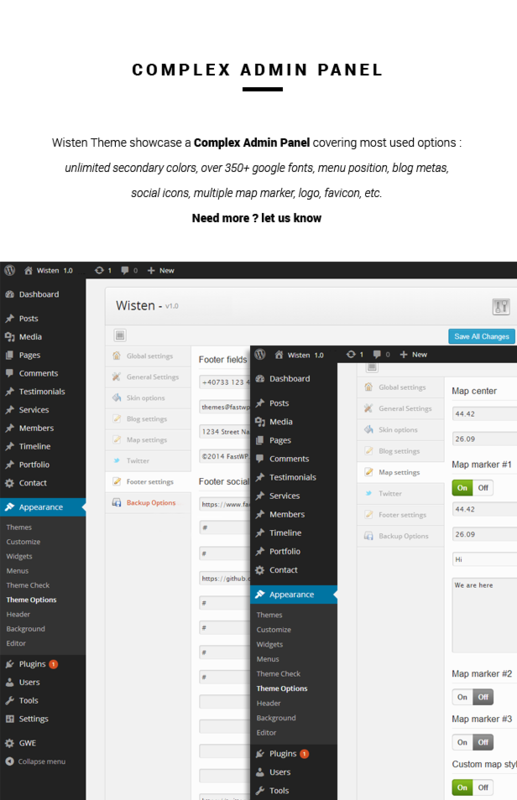 Custom Post Types – Wisten Inlcudes 5 Custom Post Type – each with custom metaboxes and options (from icon selection for services to parallax headers for Single Post). Post Formats – WordPress deafault post formats beautifully integrated in Wisten design. 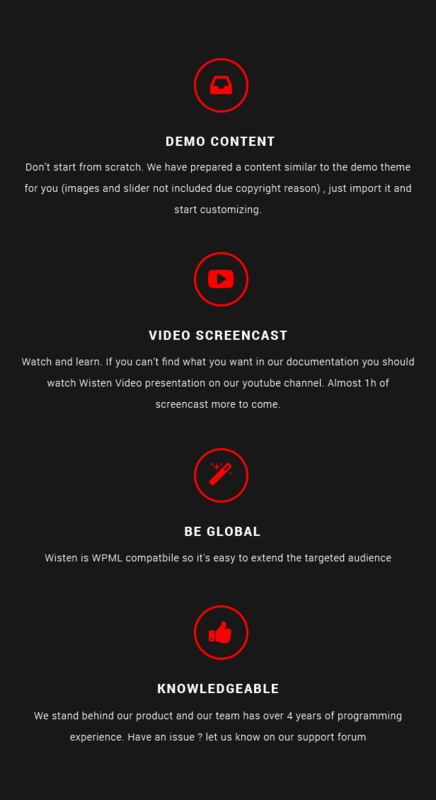 Documentation – We include the detailed documentation on how to use the theme and it’s features and almost 1h of screencast on our YouTube channel. Plus you can always submit a ticket at our help desk if you have any queries.